Luxury Holidays Nepal has created this wonderful Chitwan and Lumbini tour to add another beautiful chapter in your life book. This 4 days package with full of exciting and adventure activities to religious, historical and the places which are naturally blessed will offer you an astounding expereince. You can explore Chitwan national park, go for wildlife safari (Jungle Safari), elephant riding and enjoy the typical Tharu cultural dance in the evening. Lumbini is another destination which is famous for the birthplace of Lord Gautam Buddha. The peaceful atmosphere, serene ponds, museum are best to explore. In Lumbini, you can explore different monasteries built by different countries and also the eternal peace lamp. Lumbini is the best place to spend holidays in the serene nature. Ashoka pillar which shows that Buddha was born in Lumbini is very famous to see. After having breakfast, you will start your add on a trip to Lumbini. The drive is pleasantly filled with a beautiful view of green forest and hills and also the snaky road along the Trishuli River. On reaching Lumbini you will be dropped off at your hotel. You will have rest for sometime and go for an evening walk around cities/ or have a bicycle ride. Today, You will visit all the must see things in Lumbini which includes: Lumbini grove, The Ashok pillar, Mayadevi temple, and different monasteries built by various countries. And, you will leave Lumbini for Chitwan before evening. Today, it will be filled with different types of jungle and non-jungle activities so in other words it’s a day to have fun and to learn and observe new things. 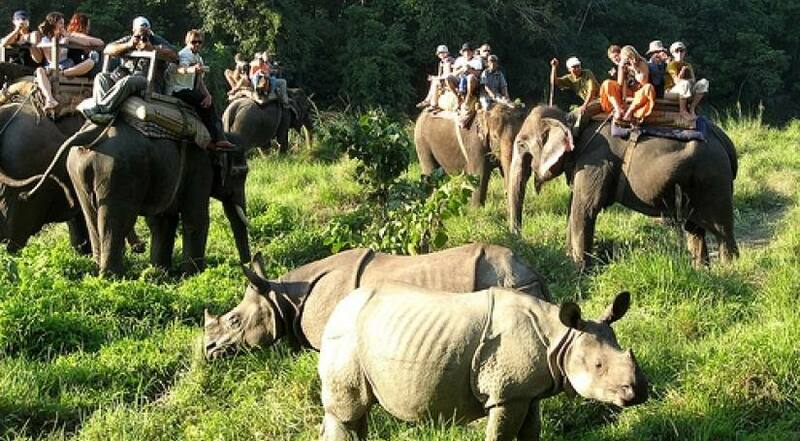 Today's Activities in Chitwan includes: Canoeing & jungle walk or a visit to the elephant breeding center. Lunch followed by an elephant safari with evening entertainment (Typical Tharu cultural Programme). After breakfast, we will do Bird watching then we will drive back to Kathmandu. As we arrive in Kathmandu we will check-in at the hotel and then rest for the day. At evening farewell dinner with cultural program. Overnight at Kathmandu. Accommodation in 4 star hotel in Lumbini (Everest International Deluxe Hotelor similar category) in twin sharing bed and breakfast basis. Accommodation in Chitwan (Hotel Seven Star or similar category) including breakfast, Lunch and Dinner on twin/double sharing bed basis. Lunch and Dinner while you are in Lumbini(Meal costs about 3 -7 dollars per item depending on the place where you eat). Luxury Holidays Nepal provides you 4 star hotels in Chitwan and Lumbini. If you want the luxury accommodation of 5 star then contact us for cost detail. In Lumbini, you will be staying at Everest International Deluxe Hotel or Similar category, In Chitwan Hotel Seven Star or similar category. You should carry the water bottle, sunscreen, camera, spare jacket, etc in your daypack. You are provided with a free locker room in the hotel of Kathmandu. The weight allowance in domestic airlines of Nepal is up to 20 kg and for more weight, you have to pay US$1 per/kg depending on the area.